Divide and execute to become the Caesar of project planning and task management diagramming. Get inShort today! "You Could Almost Do Anything" is a three-part series on communication in logo design. One of the central aims of the modern minimalist project is to remove as much visually representational information as possible, despite the inherent contradictions that implies for the design practitioner. Abstraction is one of the primary tools modern minimalist designers needlessly corrupt in order to prevent meaning from being made of what otherwise might be communicative visual signs. This preference for intentional obscurantism brings status to a class of would-be elite designers and their sycophants. Consider the body of work by MIT Media Lab professor Muriel Cooper, a native of Brookline, Massachusetts and mentor of KPCB's John Maeda. Cooper has long credited her philosophy to the reductive design principles of the Bauhaus school. In fact, she penned what has come to be known by modernist adherents as "The Bauhaus Bible." In Cooper's words, "My design approach always emphasized process over product." Indeed, this is evidenced in her own body of work. An early draft of the MIT Press logo, in which the logo's communication was not entirely imperceptible. Muriel Cooper's MIT Press logo, 1964.
Cooper made the decision to simplify the logo by arbitrarily omitting all horizontal lines–having done so, the form could just as easily be read as 'imlji,' 'nnlji,' 'uolp,' or 'oulji,' among many other possibilities. By design, the logo cannot stand meaningfully on its own. Strangely enough, this became part of the charm of the logo for those in the modern minimalist establishment, for whom ambiguity is a virtue. The invisible broken shelf that holds the MIT Press books. The mark is alleged to represent books sitting on an implied shelf. But if we were to take Cooper's word for the shelf's existence, the letterform-books would end up impossibly descending into the shelf's structure, breaking it entirely. The criteria for judging the Cooper mark have been made very clear given the explanations provided by Cooper and her biographers. The first order element to make sense of is the letters 'M,' 'I,' 'T,' 'P.' The second order is the bookshelf metaphor. The truth is, the logo fails to communicate either. You might expect designers therefore to judge the logo as falling flat on its own conceptual terms. But this cannot be accepted. Designers pride themselves on their visual discernment. So they experience an acute cognitive dissonance when happening upon a dubious, yet celebrated logo like Cooper's MIT Press mark. So in my head I'm like, "the MIT Press logo is the best logo ev-ar." And then I read up and it was done by Muriel Cooper. Yup. The instinctual response is to justify the apparent consensus. The designer says, "so what if I'm unable to parse both the primary and secondary elements of the logo? It must be the height of excellence, after all, it's in the canon!" In this way, the true genius of the MIT Press mark is in anything but its formal qualities. Instead, the logo is noteworthy precisely because it has achieved critical acclaim despite, or more accurately, because of its failure to communicate. The relief one feels after learning of the half-baked conceptual origins of the logo does not come from a sense of discovery and awe, but instead the sense that one is now in on the joke. Few are self-aware about this, and even fewer would ever admit it. Despite the incoherence of this mark, it nevertheless set the stage for MIT's future brand efforts. Pentagram's Michael Bierut and Aron Fay led the 2014 identity redesign for the MIT Media Lab. They set out to follow in Cooper's footsteps, using a similar geometric grid, which led to a comparably dense result. Trying to make sense of these marks can be a task. As with Cooper's MIT Press logo, the marks cannot stand on their own–they must be part of the complete lockup. It has been said, "it’s a Michael Bierut world after all," which makes quite a bit of sense–Bierut is one of the most highly esteemed living designers of our age. As you're acquiring that skill, you're making yourself less normal than regular people. I can see things in typefaces that normal people can't. That's not 'cause I'm better than them, it's because I just have acquired the sensitivity. The sensitivity is helpful for me to do my job, but it's not what regular people need. It is Bierut's consistency with Cooper's arbitrary rule-sets that emphasizes the hypocrisy of the modernist mindset. Bierut may well be sensitive to the typographic form, but by adhering to the reductive spirit of the Cooper mark, he exhibits a profoundly solipsistic insensitivity to the needs of his engaged audience. I don't want to over-emphasize logos in the world. I think that basically if you act with intelligence and integrity and consistency you'll develop a brand, quote unquote…You could almost do anything and make it be ok.
Perhaps Bierut is right, a designer really can do "almost anything" once they accept their role as a mere triviality. The MIT logo by Tim Blackburn and Matthew Carter, 2000. Not a decade and a half before the Pentagram design, Tim Blackburn and Matthew took to designing the brand for MIT proper. Blackburn and Carter did still reference the Cooper mark, maintaining a subtractive element, but they bolstered the communication with an application of color. Moreover, they decidedly refused to follow Cooper's rule of eschewing crossbars, and made the "t" look like a "t." In doing so, they were successful at using a healthy amount of abstraction for the context. Logos for Lip, Mill Design Studio and Michael Paul Young and IEEE. The legacy of Cooper's mark for MIT Press extends well beyond the halls of MIT. The same anti-pattern can be seen in the logo for French Watchmaker Lip, which broke the pattern slightly by including a crossbar, in Mill design studio, the logo of Michael Paul Young, the Founder & Creative Director of YouWorkForThem and also the IEEE Spectrum. The logos for the Royal Conservatoire of Scotland, Premium Beat, and Heathered Pearls on the 2015 album Body Complex. The same modernist minimalist motif has also infected music, in music production and in genres wildly different from each other. For instance, consider Premium Beat The Royal Conservatoire of Scotland and ambient chillwave artist Jakub Alexander, who goes by Heathered Pearls, both feature similar indecipherable bars in their logos. It's hardly surprising that Alexander is familiar with these modernist design patterns as he is the curator of the ISO50 music and design blog. Nevertheless, Heathered Pearls' logo serves a great segue from the static and blunt mark of old, towards an emerging and sharp dynamism. To say that the early 2000s were not Hewlett Packard's most stellar decade would be putting it lightly. HP desperately needed a turnaround, and in 2008 they reached out to design agency Moving Brands for assistance with a global rebranding effort. The Moving Brands/HP project was code-named "Dave," after cofounder Dave Packard. Packard had a modernist forward-looking perspective, and made a deep impression on the Moving Brands team. In fact, one particular quote of his inspired what would become the central visual element of their rebrand, the HP 'Progress mark.' Packard's wise words went as follows: "I suggest we focus most of our time on looking at the future because that's where we're gonna be." 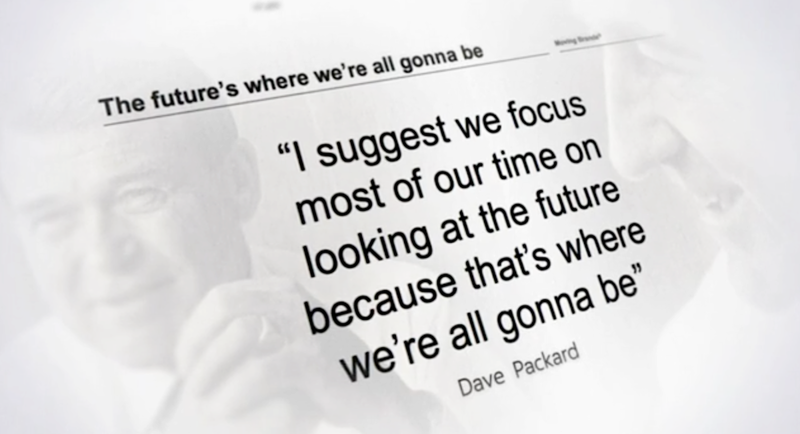 Dave Packard on what to spend your time doing. Little did Moving Brands and their partners at HP know how prescient the late Packard had been. They indeed should have looked to the future, as the rebrand project would end up taking three years to see the light of day on Moving Brands' portfolio, let alone the eight year wait before the logo mark saw the back of a product, in the 2016 HP Spectre laptop. In the meanwhile, back in 2011, Moving Brands was authorized to publish a case study on their proposed brand refresh, and it was met with rave reviews, and much disappointment. Armin Vit of Brand New lamented the "bad news" that the logo was "in a sort of brand purgatory." He exclaimed, "I hope this identity changes in full. A lot of work and thinking has clearly gone into it." Let's explore some of that deep thinking. Moving Brands' solution to this travesty was their tilted "Progress mark" which would serve as an articulation of "Human Progress." Furthermore, they aimed to give HP a "leaning forward attitude." The brand materials went so far as to display people literally leaning forward, just like Michael Jackson's Smooth Criminal. Left: Michael Jackson's Smooth Criminal, right: Moving Brands' brand guidelines. Moving Brands justified the use of a particular tilt: "13° represents HP as a company, ingenious in spirit and optimistic for the future." This choice should, of course, be immediately obvious to most of us. In this Moving Brands graphic, it is proposed that there is a simplification inevitably coming as humans approach the 2021 HP-branded singularity. Moving Brands even proclaimed that there will be a deterministic progression from the original HP logo, produced in 1941, to the 'Progress mark' to an eventual logo of "ultimate simplicity" arriving in approximately 2021, when the public should be mature enough for such a mark. The strangest thing to consider is the familial likeness of the Progress mark to Muriel Cooper's MIT Press mark. HP's 'Progress mark' does effortlessly supplant Cooper's mark in sheer dynamism. Still, it suffers from the same ambiguity, and can just as easily read as "bp" or "lip." The HP and Dynac/Dymec logos. One should note that there was a time during which HP intentionally made a reversible logo. In 1956, the Dynac company was spun off (later renamed Dymec) by HP employees, with HP ownership. They drew the reversed logo so that the design could do double duty, signifying "d," and "y" as well as "h," and "p."
Bill Hewlett explained, "Dymec was in one building and HP in the other." This was done because "they had the logo in the middle of the floor so as someone came in one direction it would say hp and from the other direction it said dy." This is quite a sensible rationale for their former logo. However, not only does the new abstract logo break this entire history, but it adds even more potential readings of the logo. Other brands do not suffer from ambiguity when the lids of their laptops are closed. Worse yet, it finds its first implementation on the HP Spectre notebook. One wonders how it escaped the designers at Moving Brands that so very often when notebook laptops are closed, it's difficult to tell down from up. This isn't so much a problem for competitors Apple and Microsoft. But with HP's Progress mark, one might well read "dq," or "dairy queen," on the lid. One would be hard pressed to find something particularly unappealing about HP's previous logo mark. Yet we must always have 13 degrees of progress. Just found this illuminating breakdown of the Moving Brands process on the HP "Progress Mark." Here's Paul Robert Lloyd, who's gone even further than HP; as well as Luke Heyes and Paul Davis. Continue on to the next installment: "You Could Almost Do Anything Part II".